I’m sorry I’ve been so out of touch – it’s been a doozy of a week here at Hotplate Confidential. But I did continue to cook, so of course there’s more to post! 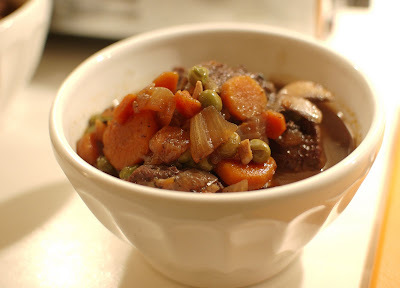 This stew (because it’s a little unfair to go so far as to call it Boeuf Bourguignon) is probably better for a Sunday evening meal in the fall because you can let it cook as long as you want. It’s also perfect for hotplates, as I made the unfortunate discovery that my amazing Dutch oven does not fit into my toaster oven! It fit in my first two – yes, I’m now on to my THIRD toaster oven in as many years – but I guess I haven’t made a stew or roast in the oven since last year. So when I came to the part in the recipe when you’re supposed to “cover the pot with a tight fitting lid and place it in the oven for 1 ¼ hours”, I decided to improvise and just keep the pot on the stove for 45 minutes. The resulting dish was excellent and even better reheated for lunch the next day. I’ve halved this recipe because I just don’t have a pot big enough for the original recipe, and I also cut out a few ingredients. Though, I think you’ll agree that this is the perfect fall Sunday Funday meal. Heat the olive oil in a large Dutch oven (again, mine is 2 ¾ qt.) Dry the beef cubes with paper towels and then sprinkle them with salt & pepper. In batches in single layers, sear the beef in the hot oil for 3-4 minutes, turning to brown on all sides. Set aside. Toss the carrots, onions, salt & pepper into the fat in the pan and cook over medium heat for 5-10 minutes, stirring occasionally until the onions are lightly browned. Add the garlic and cook for one more minute. Put the meat back in the pot with any juices that have accumulated and add the wine and broth to almost cover the meat. Add the tomato paste and more salt & pepper. Bring to a boil, cover the pot with a tight-fitting lid, and let simmer for at least 45 minutes. The meat should be very tender when pierced with a fork. 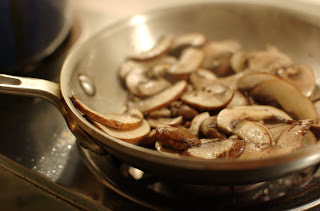 In a small frying pan, heat up the butter and sauté the mushrooms for 5-8 minutes, or until lightly browned and then add to the stew. Add the frozen peas and lower the heat. Let simmer uncovered for 15 minutes. Season to taste. Best served with crusty bread and a glass of red wine.